These are the results of Pinoy Pride 32: Duel in Dubai 2, happened at World Trade Centre Dubai yesterday August 7, 2015. 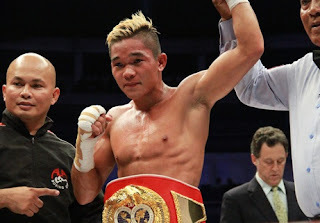 - Prince Albert Pagara wins via 1st round TKO against Jesus Rios of Mexico. Albert Pagara looking strong and ready for the IBF title fight. - Jason Pagara of the Philippines scorea a unanimous decision victory against his Mexican opponent Ramiro Alcaraz 77-73, 76-74, 78-82. - Filipino Larry Abarra scores an emphatic 1st round KO against the Indonesian opponent Tomy Arema. You can watch the fight replay on Sunday, August 9, 2015 on ABS-CBN channel 2 at 10:15 am.